At first glance, Ardy Roberto’s “Real Men Are POGI” is obviously written for men. 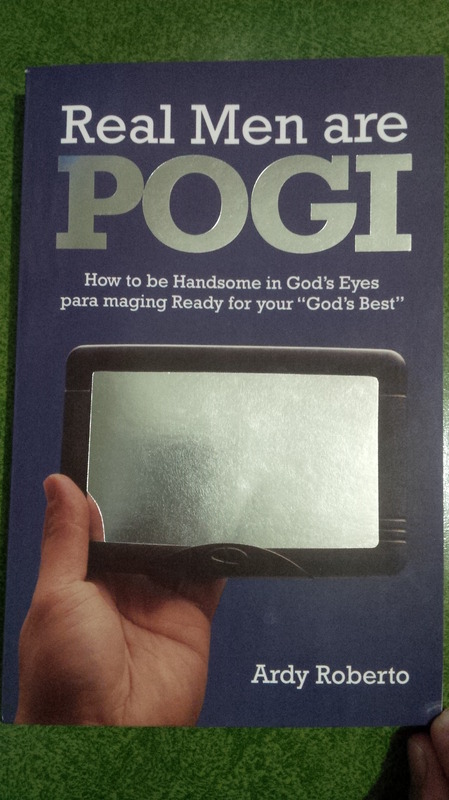 With its tag line below it, “How to be Handsome in God’s Eyes para maging Ready for your God’s best”, it serves as a man’s handbook guide for Christian living. But no book lying on our living room table would be spared from my book-hungry eyes. Once I sat down flipping through page one, this lady bookworm enters a heart-to-heart talk for real men. I’m not used in reading taglish (short for Tagalog-English) books. But Ardy’s conversational tone caught me staying up to the last page (though I wasn’t able to finish it in one sitting). Reading this book is like listening to an interesting, light, lively talk on stage. Peppered with humor and anecdotes, Ardy puts his point that goes straight to the heart. Without giving much away, I’d give you an idea what POGI means. In Tagalog, pogi means handsome. But the POGI Ardy is talking about here is a man whose character is approved before God’s own eyes: Pure, Obedient, Gentleman, Intense in his love for God, his lifetime partner, and his family. Wow! This is what a single woman would love to ask for! Although the book is addressed to men, I began checking on my character too. Being given a partner, I should also be a good steward in loving him. I should learn to be responsible in things, emotions, and thoughts. I should also learn to take care of myself so as to take care of him, too. The book serves as an encouragement that yes, there is that POGI man out there that God is grooming for me and that I am also being groomed for God’s best for me. I am also encouraged to pray more for his coming and to be prepared when he comes…in surprise! This book goes like a checklist to the kind of man that God wants for me. Also, I’d recommend all my bros and my male friends to read this. It’s true that our character cannot be perfected especially by our own. But only by God’s grace we would be able to be changed from glory to glory. “Real Men Are POGI” is just one of the books worth reading, not only to men but also to ladies waiting for their God’s best. I have every right to be annoyed, right? I’m happy with the people I’m with, got an awesome experience of being a TV reporter, and have the time I want during my off moments. But, there’s still something missing – and has never taken place yet: revival. In revival, there is brokeness. In revival, there is total surrender to the Lord. In revival, everything is unmasked. In revival, change is inevitable to the core. But these things I don’t see everyday…and we always tend to be superficial in everyway. We tend to tolerate more on the abase more than righteousness. Humility, besides, is too strange for most of us. We are too tired to seek the Lord and be willing to die to ourselves. This is the normal norm. But in revival, all norms are destroyed. What bothers me most is when we Christians claim we do the religious routines as if they make us good. Indeed, they should. But we do it without heart. We read the Bible without understanding God’s wisdom and without being willing to be rebuked. We pray without listening to His warnings. We have degraded our knowledge of Him to be a nice, warm, and fuzzy Somebody, as if we can tickle Him all the time. But He is a God of balance. He is the God of love and the God of judgement. He is the God that upholds righteousness and the God that destroys the hinders righteousness. He is the God who saves the willing and yet the God who condemns the wicked. He is never one-sided. He is fair. And yet, where are we? We don’t want this truth because we are offended. We want to be cuddled. But until we are stained, He does not want us to stay that way. We need to be shaken. We need to be burned. If we truly want to be a generation after His own heart, we have to hate what He hates. And so, I have to learn to hate what He hates. He hates sin. He hates pride. And these things are not easy to let go. I’m born in flesh and so I’m used with it. I would think myself as self-righteous and yet…that is pride. There is no love in self-righteousness. We usually miss that part. Love Him with all our heart and love others as we love ourselves, Jesus said. And so I see myself in need of a great polish. I’m not that pure. I need to get rid of my self-centeredness. I’m so impatient to see revival, but how can revival happen if I myself is not ready for it? I need to know more of Him and His heart and be willing to be rebuked and let the Lord scrub the stains of my soul – no matter how it hurts. God cleanse me. Let me not see with my eyes but with Yours. Let me hate sin but not the sinner. Send down Your fire, and purge me from within. Revival will come if we pursue it – and if we pursue the God who can make it.